�It was an exciting day for all involved and we are very proud to have the opportunity to recognize such a dynamic and up-and-coming security professional,� says Jay Bavisi, President of EC-Council, of the awards ceremony at the Global CISO Forum. Manatunge wasn�t the only executive to be recognized by EC-Council, however. There were an impressive list of finalists as well, including Justin Dolly, ServiceNow VP & Chief Information Security Officer; Nikesh Dubey, AGC Networks Inc. Senior Cybersecurity Specialist/Security Projects Manager; Edward����Goetz, Exelon Corporation VP & CISO; Muhammad Saleem, Ministry of Health, Riyadh, Saudi Arabia CISO; Gary Sheehan, ASMGi Chief Security Officer; and Paul Swarbrick; NATS, the UK National Air Traffic Service Chief Information Security Officer and Head of Cyber Security. Finalists traveled from around the world to attend the Forum and awards ceremony to participate in the keynotes, panels, and networking events taking place at the Global CISO Forum. 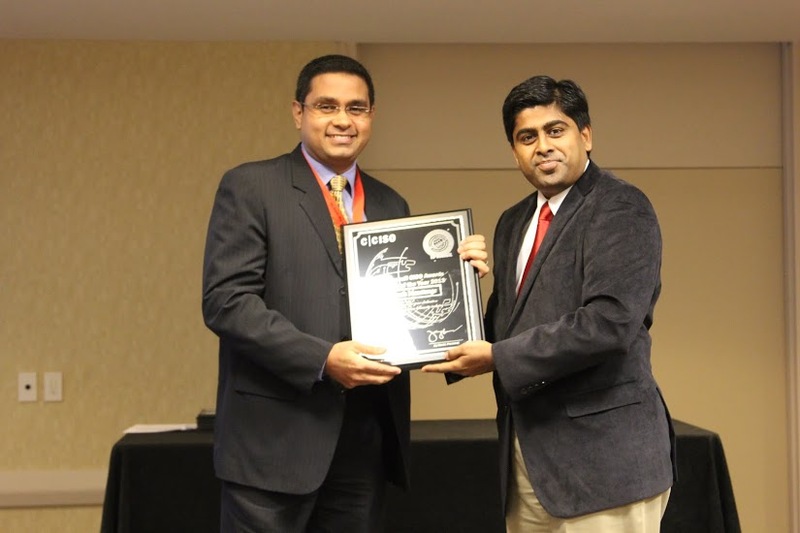 This global award recognizes Manatunge’s pioneering efforts in introducing a dedicated, independent IT Risk Management Function at Commercial Bank of Ceylon PLC in 2012. The Bank was the first local bank to undertake such an initiative which has contributed greatly in strengthening the information security and operational risk management strategy of the Bank. What set Manatunge apart from the pool of applicants was the amount of innovation he�s achieved in his short time at the Commercial Bank of Ceylon PLC. The largest private bank in Sri Lanka, Commercial Bank of Ceylon PLC is the only Sri Lankan bank to be ranked among the world�s top 1,000 banks for three successive years. Recognized as the �Best Bank in Sri Lanka� for 15 consecutive years by Global Finance Magazine, Commercial Bank has also won multiple awards as the country�s best bank from The Banker, FinanceAsia, Euromoney and Trade Finance magazines. The Bank is highly reliant on its IT infrastructure and the information it contains for its day-to-day operations as well as for its long-term strategies. Consequently, risk management plays a critical role in protecting the Bank�s information assets, as well as processes from IT-related risk. Manatunge has been able to establish the Commercial Bank of Ceylon PLC as a role model to other Banks by setting a higher benchmark in the areas of information security and risk management that will contribute to the financial services industry as a whole. Manatunge was nominated for this recognition by Boshan Dayartne, the CEO of CICRA Holdings.